Dubai, UAE, May 09, 2018: Cooking up sumptuous suhoors and celebratory iftar feasts shouldn’t involve a lot of time or stress. Thanks to Panasonic, every meal preparation this Ramadan is a breeze with the help of its premium kitchen appliances. Launching its Ramadan Campaign in the (country name), Panasonic aims to ‘bring quality home’ as family kitchens across the Middle East region get busy preparing a spread teeming with great-tasting platters of sumptuous meal. The campaign features Panasonic’s premium line of kitchen appliances, known for its excellent Japanese craftsmanship, innovative features and reliable performance, which are sure to bring memorable family time together not only this Ramadan but all through the year! “Panasonic’s continuing commitment to its customers is to make their lives better with distinctive products that offer the best and most reliable features. Noting how special Ramadan is, we want our Middle Eastern customers to enjoy effortless and seamless cooking experience with our top-class kitchen appliances. As it has always been since Panasonic’s beginnings 100 years back, our products are developed with the highest standard of Japanese craftsmanship and quality, designed to deliver ease of operation, which is extremely helpful during the Holy Month of Ramadan,” commented Keisuke Nakagawa – Director, Consumer Marketing, PMMAF. Sachin Wadhwa, Managing Director of Al-Futtaim Electronics said, “In keeping with the spirit of Ramadan, Al Futtaim Electronics takes immense pride in offering customers in the UAE Panasonic products that are of great value and which uphold the highest standards of Japanese craftsmanship. The Panasonic range will further enhance the festive experience with delicacies made using the brand’s premium Meat Grinder, Juicer & Microwave Oven. The campaign intended to allow consumers to build a personal connect with Panasonic this Ramadan, will be seen on digital and broadcast media across the region captivating the audiences with its engaging content. This along with a dedicated social media campaign targeting consumers is set to bolster Panasonic’s brand equity and market share. Enjoy mouthwatering homemade minced meat made with fresh ingredients with Panasonic’s powerful and easy to use meat grinder. This made in Japan appliance offers professional performance in the comfort of your home with its innovative features such as 3500W Ultra Powerful Motor, stainless steel Samurai Blades and versatile, interchangeable cutting plates and attachments for perfectly ground meat. Also featured in this line up are meat grinder models MK-ZJ2700, MK-G1800 and MK-ZG1500. 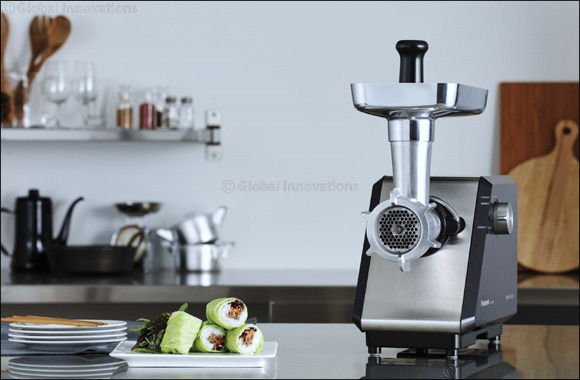 Panasonic meat grinders are ideal for preparing traditional Ramadan dishes such as meat samosa, kubbe and kabab. Drinking fresh juice is essential in Ramadan to prevent dehydration and revive your body with nutrients after a long day of fasting. Panasonic offers the innovative MJ-DJ31 with unique features that meet a wide variety of needs, including precise and durable full metal S-shaped cutter that firmly holds fruits in place as they are being juiced, large 75mm diameter feeding tube that eliminates the need to cut up fruits and veggies into smaller pieces, plus a 120-degree swivel spout for easy pouring. With models MJ-DJ01S, MJ-SJ01W and MJ-H300 also featured in the lineup, you’re sure to find the juicer that is ideal for you. Enjoy 5-star cuisine with Panasonic’s best-in-class microwave oven. Built with the brand’s ingenious inverter technology, NN-CD997 offers five versatile cooking modes – convection, grill, microwave, 2 level convection and combination – that help deliver delicious, healthy cooking results in less time. It also has a Turbo Defrost feature for faster food thawing. Other models featured in this line up are NN-ST785S, NN-GD37 and NN-CD671. Panasonic also offers its MX-AC400 Super Mixer Grinder with Four Jars and MK-F800 Food Processor with 13 Attachments which will let homemakers prepare their most decadent Ramadan meals. Panasonic products are available at Al Futtaim Panatech showroom (Deira - Dubai) and various mass merchandiser stores across United Arab Emirates.